The pituitary gland consists of the anterior pituitary and the posterior pituitary. The pituitary gland is connected by a system of blood vessels to the hypothalamus. This system of blood vessels is known as the hypophyseal portal system, and it allows endocrine communication between the two structures. The mechanism for hormone transport via hypothalamoportal vessels involves cells that are regulated by different nuclei in the hypothalamus; for instance, neurons that release neurotransmitters as hormones in the connective link between the pituitary and the brain. pituitary gland: An endocrine gland, about the size of a pea, that sits in a small, bony cavity at the base of the brain whose secretions control the other endocrine glands and influence growth, metabolism, and maturation. hypothalamus: A region of the forebrain located below the thalamus, forming the basal portion of the diencephalon, that regulates body temperature, some metabolic processes, and governs the autonomic nervous system. hypophyseal portal system: The system of blood vessels that link the hypothalamus and the anterior pituitary in the brain. The pituitary gland consists of two components: the anterior pituitary and the posterior pituitary, and is functionally linked to the hypothalamus by the pituitary stalk (also named the infundibular stem, or simply the infundibulum). Whilst the pituitary gland is known as the master endocrine gland, both of the lobes are under the control of the hypothalamus: the anterior pituitary receives its signals from the parvocellular neurons, and the posterior pituitary receives its signals from magnocellular neurons. hypothalamic-releasing hormones from the hypothalamus that bind with receptors on endocrine cells in the anterior pituitary that regulate the release of adrenal hormones into the circulatory system. Hormones from the hypothalamus are rapidly degraded in the anterior pituitary, which prevents them from entering the circulatory system. 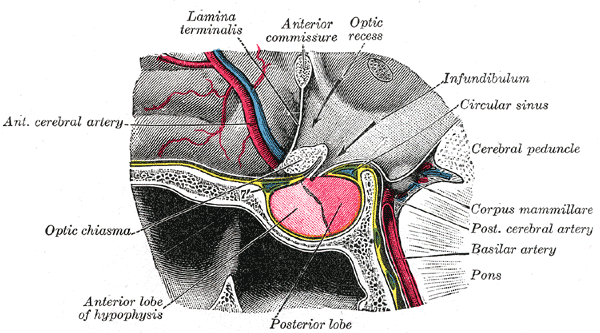 The posterior lobe of the pituitary gland develops as an extension of the hypothalamus. As such, it is not capable of producing its own hormones; instead, it stores hypothalamic hormones for later release into the systemic circulation. Pituitary gland: The anterior and posterior lobes of the pituitary (hypophysis) gland are shown.